A religious sympathy flower arrangement creates a thoughtful display. These displays are often used for religious memorial services. They may be held for a clergy member, or for members of a church. What Is A Religious Sympathy Flower Arrangement? 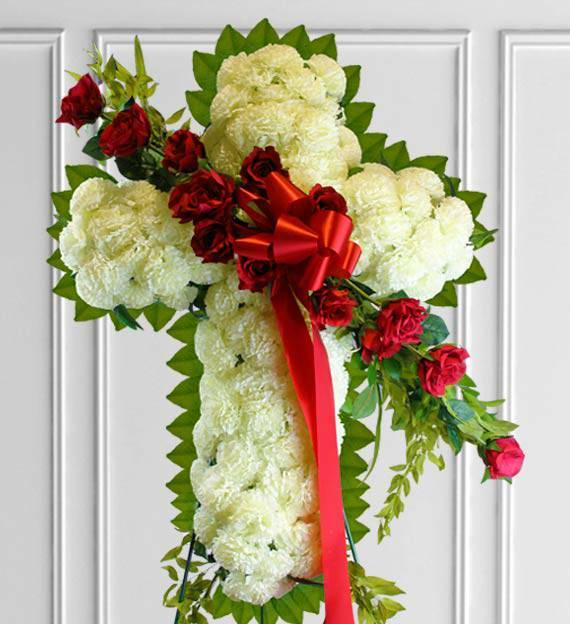 A religious sympathy flower arrangement often features a cross. These are typically created with flowers on a standing display. They are often placed near the casket or at the graveside area. The size of the display can vary, with some being several feet tall. Others may be smaller, and may be placed on top of the casket. The size choice is often a personal one, instead of a tradition. Smaller options may also be placed on a floral stake for displays. These are popular choices for services as well as graveside markers. Many different flower choices are available for these creations. What Sympathy Funeral Flowers Can Be Used For Displays? There are many options to choose from for sympathy funeral flowers. The top choices include roses, carnations, tulips and lilies. Other blooms may also be used to provide color or a meaning. A single bloom type can be used for a more uniform look on crosses. To do this, different sizes of carnations or roses are often used. Day lilies or daisies may also be used when they are available. The color can depend on the type of memorial service being held. White or red colors are often used to create a traditional display. Pink or blue can be used for a more gender oriented arrangement. Traditional colors are used for those who are older, such as parents. They are also typically selected for clergy members who have passed. Small pops of color may be added, such as yellow or peach and pink. Arrangements for those who are younger often feature brighter blooms. This often means shades of yellow, pink, blue and orange for flowers. They may also feature a matching sash with a name or a message. Personalizing the religious flower arrangements is also possible. To do this, a favorite message or passage can be added to sashes. This is displayed across the cross, or just above or below it. For those who are religious, a favorite passage is often selected. These passages typically contain words of comfort during tough times. This is ideal when someone close has passed, such as a loved one. Another top option offered by some florists is a spray of roses. These are placed diagonally on the cross in a show of color. This is often available on deluxe models and feature bigger blooms. Upgrading sympathy flowers is another way to personalize arrangements. Upgrades may include a message, such as a sympathy card or passage. They also offer better quality blooms that look truly elegant. Our sympathy flowers delivery service can make it easier to send blooms. We can deliver with care and set up ahead of the service time. This makes it easier for those planning a funeral or memorial.